Ever seen a ghost? Witnessed some sort of paranormal activity? 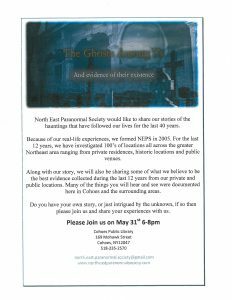 Please join us on may 31st at 6-8pm to hear the Northeast Paranormal Society discuss their real-life experiences pursuing the paranormal. Along with their stories they will share their best evidence collected over the last 12 years. In fact many of the thing they have witnessed and recorded here in Cohoes and the surrounding areas.